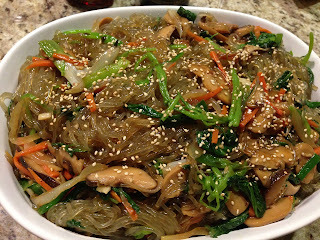 I love Japchae! Hubby doesn't, so I almost never get to eat it at Korean restaurants unless we go with other people and they want to eat it too. The same goes for the seafood pancake. But that's another discussion all together. It's simple enough to make, but I have no clue why it costs so bloody much when we have it in restaurants. It's so crazy cheap to make! I guess the hardest part is to find the noodles, but you should be able to find them in most Asian supermarkets. I always just get mine from T&T, along with all the other ingredients. I find it to be the easiest when you use your hands to mix everything in a big bowl, so gloves are definitely recommended. Bring a large pot of salted water to boil. Blanch spinach and use tongs to transfer spinach to a large mixing bowl. Using the same cooking water, cook noodles for 5 minutes or so until al dente. Rinse under cold water 3-4 times until all the starch has been removed. Add to the large mixing bowl and mix with 3 tablespoons each of soy sauce and sesame oil until well-coated. Set aside. In a large pan, stirfry onions, carrots and mushrooms in 1 tablespoon of sesame oil on medium heat until tender crisp. Stir in the garlic. Season with 1 tablespoon of soy sauce and sugar. Transfer to the large bowl and add remaining soy sauce and sesame oil. Put foodsafe gloves on and start mixing until veggies and noodles are well combined. Add more sesame oil if it's too sticky and season with more soy sauce, if necessary. (Optional) garnish with a sprinkle of sesame seeds and serve as a full meal or as a side dish. Dried shitake mushrooms are easy to rehydrate. Just put them in some lukewarm water for a couple of hours, and you're good to go. If you're running low on time, soak them in hot boiling water for 30-60 minutes until they don't feel hard anymore. It tastes better if you have the time to soak them in lukewarm water as opposed to the hot water though. The stalks are always woody so just chopped them off and throw them in the trash.